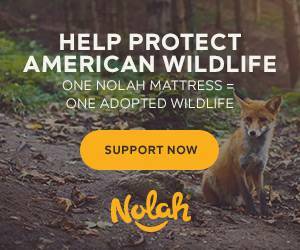 Nolah Mattress Review & Coupon - Sleep Better And Save An Animal! The Nolah Original mattress may be a side sleepers dream come true. This bed accommodates all shape, sizes and sleeping positions, but really appeals to the dominant side sleeper. The contouring yet easy to move on layers perfectly conform to the shoulders and hips. All while providing generous and ideal support. Creating a bed that not only impresses but isn’t going to break the budget, especially with their generous coupon. 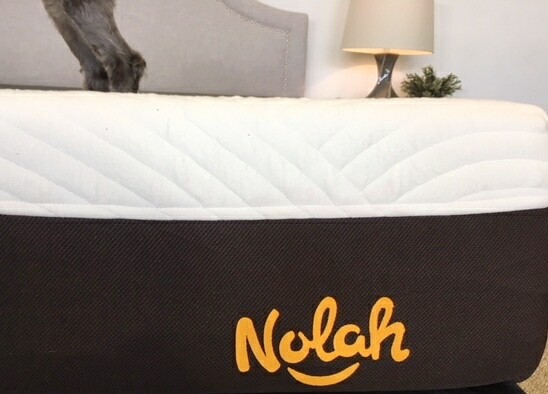 Check out our Nolah mattress review video below! Latest Nolah Mattress Coupon: Found HERE! 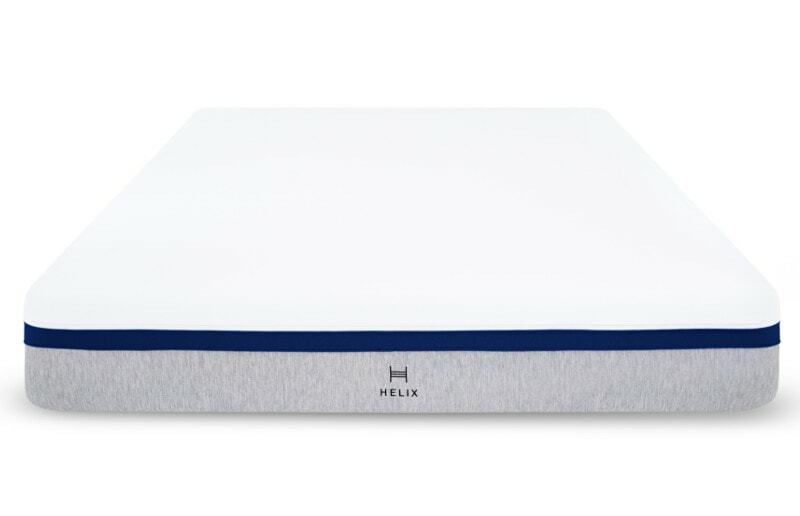 This 10″ thick mattress has 3 layers of foam to create an ideally comfortable and supportive feel. The materials are innovative and are great for every sleeping position. Giving this medium feeling bed just the right the perfect amount of softness to provide balance and hug. As well as enough bounce to let you move from side to side with ease. It also has optimal support that will create great spinal alignment and proper ergonomics, in any sleeping position. Nolah Mattress is a company who focuses on using the newest technology to create the best all foam mattress possible. The proprietary Cooling Nolah Air Foam takes the benefits and appeal of memory foam, but with added cooling properties. As well as better pressure relief by 4 times. They’ve also incorporated a layer of Avena Foam. This foam has similar properties to latex and is very responsive. This layer makes changing sleeping positions easier and is even more durable. Giving great adaptability and appeal to this well-priced bed. Sleeping comfortably is just one of the many benefits of this bed. Including minimizing motion as well as providing a consistent feel from edge to edge. And as mentioned incorporating technology that sleeps cooler than most all-foam beds. This USA made bed is even shipped for free right to your door. It also comes with a lifetime warranty and 120-night sleep trial. Giving you ideal side comfort at a great price with plenty of perks. Another unique quality about Nolah is their advocacy for wildlife. They are so dedicated to this cause that they have partnered with Defenders of Wildlife. With every mattress purchase, a portion is donated to adopt and save an animal on your behalf. They even send you an adoption letter and information on the animal you saved in the process. Talk about another reason to sleep even better! Below we have our comprehensive and detailed Nolah Original mattress review. We will go through how it performs for comfort, motion transfer, sleeping cool and edge support. As well as go through the delivery process, value, materials, and construction as well as the trial period and warranty. 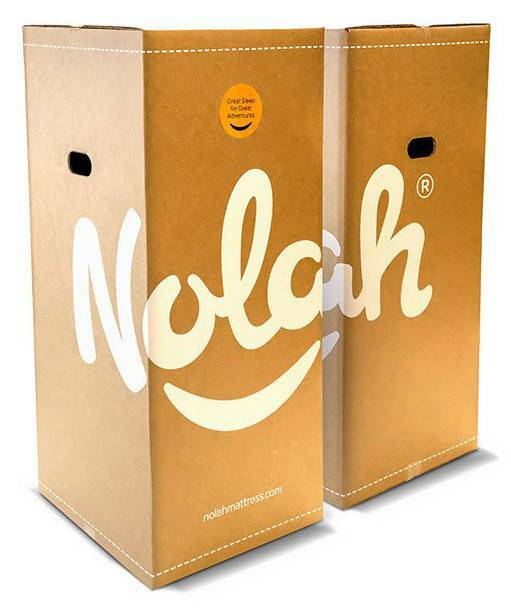 The very first thing to do with your new Nolah mattress is take it out of the box and get it set up. It should show up right at your door and in a fairly compact box, for a mattress anyway. Getting it to where it needs to go may take two sets of hands. It is about 75 lbs and a little awkward to maneuver if you are on your own. Once you get it to where you’ll be sleeping it should only take a few minutes to get it out of the box and take it out of the plastic and come to life. During the unboxing process, you might notice a bit of off-gassing, but it should be very minimal. With most boxed mattresses there will be a little bit of smell once it is allowed to unroll and take shape, but this one is made in the US which helps tremendously with cutting down on any noxious odors. It should be fine within a few hours but if you are more sensitive to certain smells letting it breath up to 12 hours would probably be a good idea. Also, this mattress will need a few hours to fully expand before sleeping on it. But should be good to go in no time. When setting up your new Nolah mattress it will need a foundation that provides a flat, even surface that will support the weight of the mattress as well as the sleepers. It also will need to be the right height for you as well as be aesthetically appealing. The Nolah bed would work great on a box spring with or without a frame, an adjustable base, a platform bed or slatted bed. To find a foundation option that would work for you, check out our frames & bases reviews too. This mattress will be great for back sleepers and even okay for the occasional stomach sleeper. 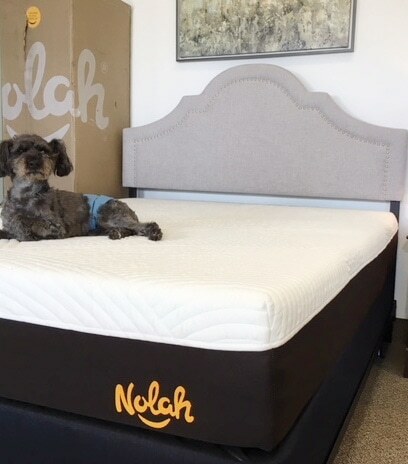 The Nolah mattress would be ideal for side sleepers because it is a medium feel, but also because it is just soft enough for your shoulder and hip to perfectly sink in. This soft yet supportive feeling mattress has plenty of dense core support from the base for proper alignment. However, the comfort layers really have the perfect balance of contour and pressure relief to make for a great night sleep for side and back sleepers. If you are a heavier person this mattress may work well for you but it will probably have more of a medium-soft feel. 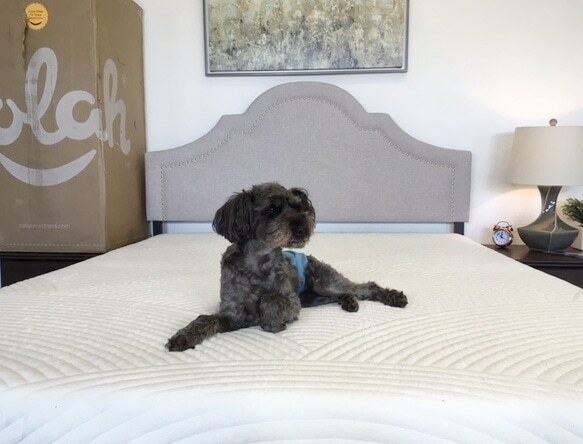 While sleeping on the Nolah original all foam mattress we noticed it to be a very balanced feel. You can appreciate the softness and pliable comfort in the top layers but still have plenty of support from the base foam. The combination of the Cooling Nolah Air Foam paired with the Avena Foam made for great pressure relief that was still easy to move on. It also was a great bed for sleeping on your side and back and even would work well for occasional stomach sleeping. Best Nolah Bed Coupon & Savings: Found HERE! This mattress is an all foam mattress and like any all foam mattress it should have minimal motion transfer. They do use a layer of Avena foam which will be slightly more responsive, however, it is below the Nolah foam that is more which is similar to a memory foam that will soften the vibrations immediately. This mattress also has a dense base foam that will also help eliminate and deaden any movement. You should feel very little motion transfer on this bed. The Nolah will make a great mattress for anyone who shares a bed, even for a light sleeper, because of its ability to effectively isolate motion. 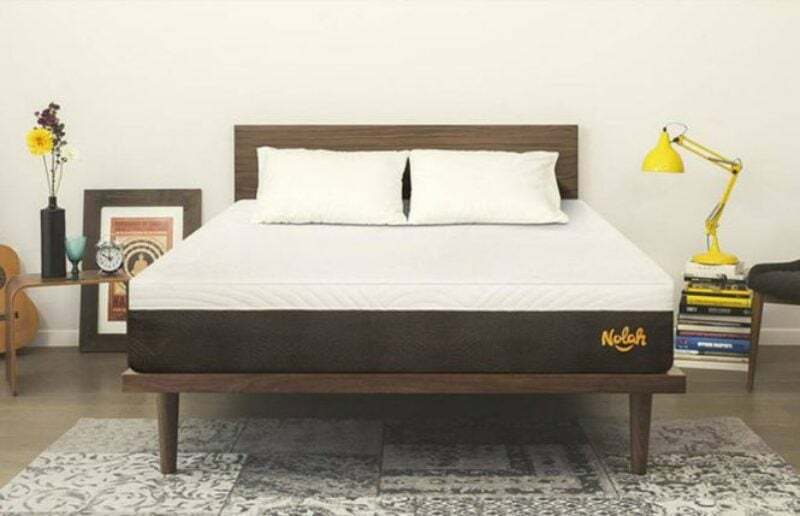 The Nolah mattress was designed to focus not only on comfort in the way of feel but also in how well it doesn’t retain heat and maintains a comfortable temperature. They achieved this by focusing on creating a top layer of Cooling Nolah Air Foam that has billions of pockets of air that allow for circulation and breathability. This technology helps heat to dissipate and keep you cool all night long. This innovative top layer is also NOT temperature sensitive like memory foam. You still get the same feel of memory foam without the negative overheating qualities. The middle layer of Avena foam also helps contribute to keeping you cool. This foam is more responsive and allows you to not to feel like you are “stuck” in the mattress. This layer helps you easily move and change positions that inadvertently helps keep you cooler as well by not sinking in too much. The cover of this mattress is made of viscose, this soft and silky material not only feels great to the touch but also wicks away moisture and helps dissipate excess body heat. The edge support on the Nolah mattress feels stable and creates a solid, edge to edge usable sleep surface. The dense base firm provides the necessary support to give the entire mattress a solid foundation, including the edges as well. Sleeping on this mattress you are able to feel a consistent feel across the entire top of the bed. As far as sitting on the edge goes, there is a little less support, but is still very solid for minimal sitting use. This mattress is priced at $949 for a queen which is a great price for the quality and innovation of this well-made bed. It also comes with free shipping and an impressive 120-night sleep trial and 15-year warranty. What makes it an even better value is the fact that you can get an additional $125 off just by using the coupon code found here when purchasing. To shop and save on the Nolah mattress visit: Nolahmattress.com. The Nolah mattress is a made up of three layers that make up a 10″ mattress of great, comfortable materials. The top 2″ are made of Cooling Nolah Air Foam, then under that is 1″ of Supportive Avena Foam. This sits on top of 7″ High-Density Base Foam. All of this is covered in a natural Viscose Cover that is ultra soft and luxurious. It is the only online mattress that has 360-degree wrapped luxury cover. 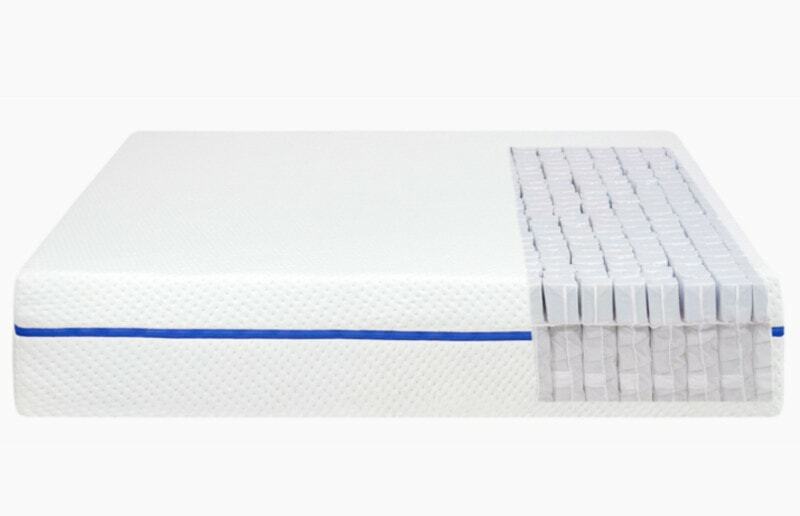 The Nolah mattress has a 120-night sleep trial period. This is a bit longer than many other online mattress companies offer. This should offer you plenty of time to try the mattress and decide if it’s for you. If for some reason it doesn’t work out the company will easily accommodate returns. This mattress also has a limited lifetime warranty. This again is above the standard industry average. It also shows that they truly stand behind their mattress if they are willing to go the extra mile to warranty it for a few more years than most competitors. 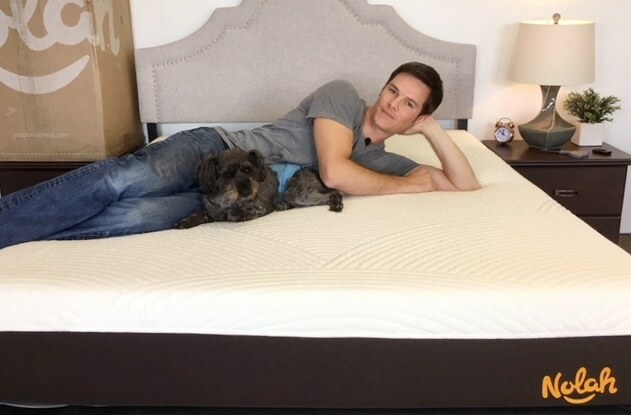 We hope you’ve enjoyed out Nolah 10″ Mattress Reveiw. If you are looking for more specifics for the Nolah trial period or warranty find out more at nolahmattress.com. Or for a helpful tool check out Our Mattress Warranty & Trial Period Guide. Also, remember that if you have questions or need more insight during your mattress buying journey, please feel free to contact us. We at Our Sleep Guide are here to help and make sure you find the best mattress for you! The Nolah mattress is an all foam mattress with an ideal feel, especially for side sleeping enthusiasts. With a balanced feel and great price point this mattress may be a great bed for you. You like a medium feeling mattress that provides the feel of memory foam with 4x better pressure relief and cooling properties. You are a side sleeper and like a mattress that has plenty of support but also allows for ideal comfort and contour for your hip and shoulder to sink in. You want a mattress that won't get hot, has great adaptable comfort and comes in at a great price point. Still looking for some more information? Visit Nolah at nolahmattress.com. Also, have questions for us? Please contact us and we would be happy to help you!